We generally carry out three steps on quality control. 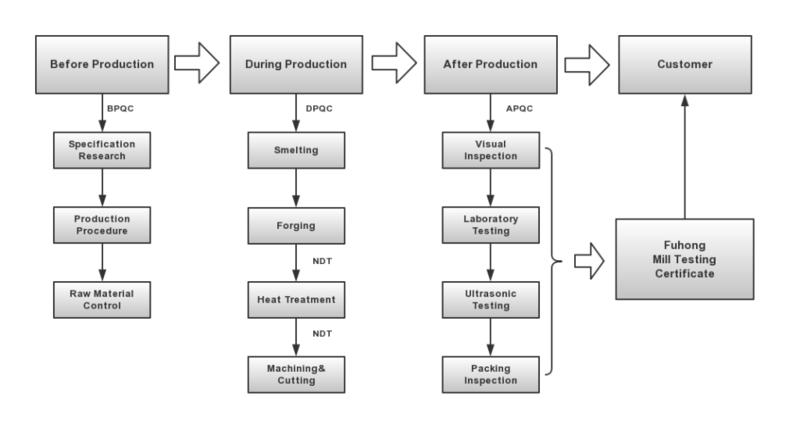 BPQC:Check the specification and the production techniques to ensure that every production procedure will lead to the proper quality. DPQC:According to production procedure,DPQC are carried out to ensure production can meet the designated technical requirements.Do necessary tests during the production. Break point will be carried out in Smelting,Foring,Heat Treatment and Machining procedure. APQC:After the production of products,Fuhong will carry out quality inspection for final products.Testing results for each testing will be recorded to ensure that all products meet customer requirements. Our long-standing relationship with steel mills which have reputation in the industry ensures you the highest quality raw materials. All raw materials are fully traceable ,and meet the material standards. Governed by our quality control system, which is ISO 9001 registered, our products are controlled to ensure a high level of quality at every processing step. Our on-site NDE control utilize Magnetic Particle, Liquid Penetrant, and Ultrasonic Testing methods to guarantee our products meet the quality standards. Logo transplantation would go through the whole production processing.When one step has been finished,the identification on the last step would be transferred onto the product.The identity of the products even can be traced back to its smelting furnace,heat treatment batch number.